Lemon and blueberries are a beautiful combination not only in color, but flavor. This lemon cake inspired by The Barefoot Contessa is perfect for breakfast, a middle of the day snack or after dinner sweet fix. I won’t say it’s guilt-free, but for a cake it’s healthier than most. It’s not overly sweet and the yogurt makes the cake super moist. 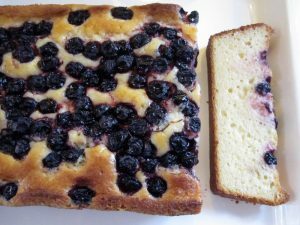 If you want the blueberries laced throughout the entire cake, toss them with a tablespoon of flour (to keep them from sinking) and fold in gently. Preheat the oven to 350°F. Grease and flour a 8 1/2 by 4 1/4 by 2 1/2-inch loaf pan. Whisk together 1 1/2 cups flour, baking powder, and salt into 1 bowl. In another bowl, whisk together the yogurt, 1 cup sugar, the eggs, lemon zest, vanilla and oil. Slowly whisk the dry ingredients into the wet ingredients. Pour the batter into the prepared pan and sprinkle blueberries on top of the batter. Bake for about 50 – 60 minutes, or until a cake tester placed in the center of the loaf comes out clean. Meanwhile, cook the 1/3 cup lemon juice and remaining 2 tablespoons sugar in a small pan until the sugar dissolves and the mixture is clear. Set aside. When the cake is done, allow it to cool in the pan for 10 minutes before flipping out onto a cooling rack. Carefully place on a baking rack over a sheet pan. While the cake is still warm, pour the lemon-sugar mixture over the cake and allow it to soak in. Cool.